Virginia Anglers Sued for Fishing on Property Deemed “Public” by Game Dept. Fly anglers often float large sections of the Jackson River on kayaks to gain better access. 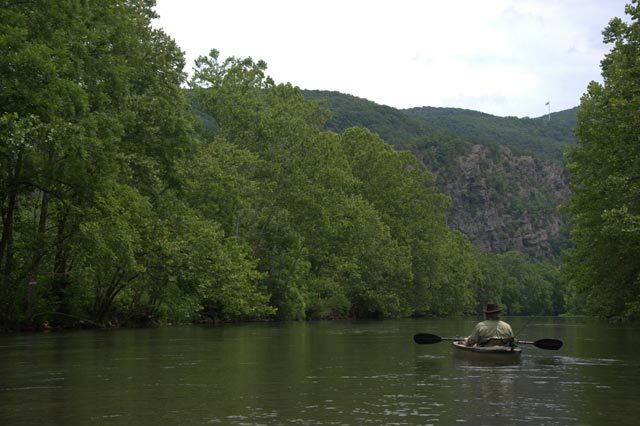 Covington, Virginia: On July 25, 2011, Alleghany County Court will hear arguments in North South Development v Garden, in which plaintiffs are suing three anglers—one of whom is a pastor—for trespassing. Court documents filed by the plaintiffs (also the landowners in the case) argue that in June 2010, the anglers were fishing a section of the Jackson River that the landowners claim to own. Indeed, the landowners pay taxes on the river bottom and own or lease land on both sides of the river. They have also clearly posted the land with signs, visible from the river, which state that anglers may not fish or wade in that section of the river. The defendants claim that they were on public property because they were standing in the middle of the river well below the high water mark and therefore paid little heed to the signs because they weren’t on dry land. Even more significant, the defendants note that the Virginia Department of Game and Inland Fisheries (VDGIF) signs at public put-ins along the river explicitly state that anglers may fish and wade in that section of the river. Gary Martel, Deputy Director of Wildlife Resources with the Virginia Department of Game and Inland Fisheries, says, “We are aware that signs are posted along portions of the Jackson River that we view as public and not private property. Anglers will not be cited by our Conservation Officers, however, as long as they have a legal fishing license and remain in the river.” This may be cold comfort to the defendants in the North South Development v Garden case. Virginia law states that navigable streambeds are public and open to Virginia citizens to enjoy, and that land not otherwise conveyed is the property of the state and held in trust for the public’s use and enjoyment. Nevertheless, usage issues are nothing new to the Jackson River. A 1996 case before the Virginia Supreme Court concerned two 18th-century grants from the Crown of England to private citizens; the grants had expressly conveyed the property on both sides of what was to become the Jackson River as well as its streambed and all the privileges therein to these individuals. In its Kraft v. Burr decision, the Virginia Supreme Court held that the British Crown had had the authority to convey such exclusivity to individuals and that those claims now rested with the current riparian owners of the crown grant properties. The section of the river off limits to anglers since the Kraft v Burr decision is highlighted in yellow on state maps posted at public access points along the Jackson River, and anglers are advised to avoid that area. The section of the river in dispute in the North South Development v Garden case is downstream and lies between Smith Bridge and Indian Draft, which are public access points. The Commonwealth takes in millions of dollars each year from recreational anglers. But those same anglers might think twice about fishing in Virginia if they believe that they might fall afoul of the law—and spend thousands of dollars defending themselves in court—when they have placed their trust in the very maps they received from the VDGIF.